I flew into Anaheim late last night and stayed up even later trading war stories with my roomie and friend, Christine. But that late night didn't keep us from waking up early for the runDisney #TinkHalfMeetUp! She and I were both lucky enough to send in our RSVPs in time to secure a spot to this most magical event. When we arrived we were given the precious runDisney tech tee and then huddled up under the Mickey Sorcerer hat socializing & waiting for the run to begin. After providing us with a brief overview of our morning, runDisney's Bob Hitchcock introduced us to our special guests: Olympian Jeff Galloway, actor Sean Astin, Biggest Loser winner Ali Vincent & runDisney nutritionist Tara Gidus. Then we were off! We ran through Downtown Disney using Jeff's walk/run method. We ran 30/30 - meaning 30 seconds of running, 30 seconds of walking. Before we knew it - we were heading into Disneyland. We ran through the castle, through Adventureland, around New Orleans Square and by the Matterhorn. It was so much fun and so perfect being inside the park so early in the morning. As we ran through the park Christine and I had a feeling something special was in store for us...and we were right. Tinker Bell was waiting for us at Pixie Hollow! Perfection! After photos with Tink we made our way back down Main St. USA and exited through the Disneyland front gate. We ran across the Esplanade to California Adventure. The sunrise was gorgeous this morning! We ran across the boardwalk and along Paradise Pier. I couldn't resist taking this photo. Every time I read it I always think, "I'll miss you too!". "Thanks for visiting. We miss you already!" 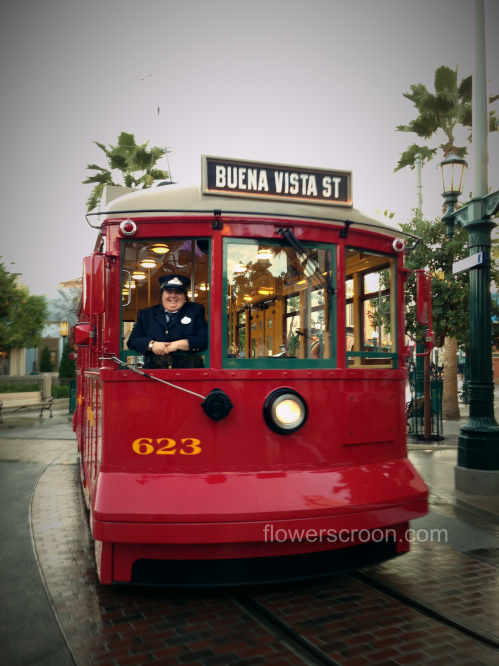 Our run ended on Buena Vista Street where we began taking more photos. While we were taking photos, Mickey, Minnie and Goofy appeared dressed in their dapper best! runDisney photographers took a group photo of all of us. Then we formed lines and took photos with the characters. I was, of course, Tweeting the entire time! Woo hoo! 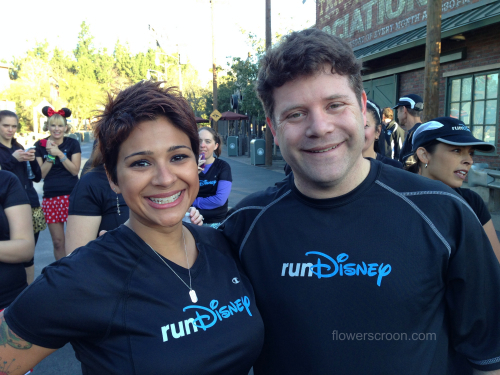 As we waited for our turn to ride Racers, I met Sean Astin! Lucas, Goonies and The Lord of the Rings are on my list of favorite movies I've watched repeatedly. Plus, I'm a huge fan of his mom! It was such a pleasure to meet him! He is very kind. Sean asked Bob to please take that photo of us, and handed him my iPhone. In return, I jokingly said that when I was done with Sean I'd go stand in the "Bob photo line". That's when Sean said he was actually the photographer for the Bob line. It was pretty funny. I was the one and only soul in the Bob photo line. After photos we went straight to Radiator Springs Racers. Thank you runDisney for the private ride on Radiator Springs Racers! The entire morning had been packed full of surprises, and runDisney still had more in store for us. We walked to our next location: Napa Rose. Here at Napa Rose all of our special guests took turns speaking to us. Jeff Galloway answered questions, gave us tips and spoke about the walk/run method that works for him and countless other runners - myself included. Check out his Perfect 20 WDW Marathon ring. I follow Sean Astin on Twitter, and always see him using the #run3rd hashtag, but never quite knew what it was all about. Well, it's very simple really. He runs 1st for himself, 2nd for his wife and kids and his #run3rd is for YOU. It's about putting in those miles in dedication of others. I love it. Ali Vincent was a nice surprise. She is the first female winner of "The Biggest Loser" - a reality television weight loss game show. Yes, you read that correctly. Not my cup of tea at all; I think it sends a very unhealthy message about health and weight loss. However, Ali has taken her win and really made something amazing of it. She has a show called "Live Big with Ali Vincent" on the LiveWell Network where she shares tips & stories and inspires healthy living. I really liked her. Last, but not least, was Tara Gidus the "Diet Diva". She is the official runDisney nutritionist. She shared some really great pre-race nutrition tips with us and answered my questions as well later when we had time to talk. Loved having her here! Speaking of nutrition, we were a little hungry after that early morning run. No worries, runDisney had us covered with a cooking demonstration from none other than Executive Chef Christine Weissman. I am such a chef fangirl - seriously. This was the most exciting part of the meet-up for me! Yum! And with that final, delicious morsel, the runDisney #TinkHalfMeetUp had come to an end. But not before one last surprise. Thank you runDisney for hosting such a wonderful event! This has been my favorite meet-up thus far. 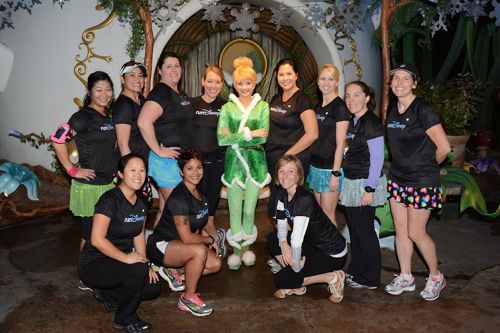 Such a fantastic culmination of events this month - from the WDW Marathon Meet-Up and Goofy Challenge to the Tink Half Meet-Up back home in California. I should be exhausted, but I could not be more ready to conquer those 13.1 miles on Sunday! If you would like to be part of an event like this, be sure to follow: @runDisney, @DisneySports @DisneyParks on Twitter as well as the Disney Parks Blog. The announcement for this meet-up was made on Twitter a couple of weeks before the race, and the meet-up was held 2 days before the race.